Last season was tough for the Crested Butte Titans boys basketball team. On paper and at the start, the team was looking strong and definitely on pace to wreak havoc in their league. Then tragedy struck in just one game as the Titans lost key varsity players Tommy Linehan and Michael Winn for the rest of the season to injury. That left coach Brandin Hamilton no choice but to look deep into his bench for the varsity squad midway through the season. “We were losing games by 20 that we would normally be in or possibly win,” says Hamilton. Still, Hamilton and his players remained focused and never gave in, plugging away, gaining strength as the season progressed. They made it into the post-season but fell in the first round. Nevertheless, it was still a quality season, given the circumstances. “We got to a point where we gave ourselves a chance, and that’s all you can really ask for,” says Hamilton. This season, the Titans have no shortage of players with a big senior class and a big freshman class making for 28 players this winter. Hamilton has Mike Bacani back as an assistant and picked up WSCU student and former collegiate player Bryant Knigge to help out, as well as former Titan player Luis Aguirre. 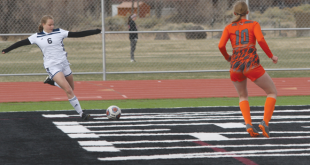 Practices in the pre-season have been challenging as Hamilton looks to wrangle the players into quality workouts, as well as get them scrimmage time, all the while sharing gym space with fall sports wrapping up and the girls basketball team. While the program lost just two players to graduation, one of them was Joseph Cummins, their point guard and leading scorer. But with his current numbers, Hamilton feels he can make up for that loss of scoring in a more dynamic way. 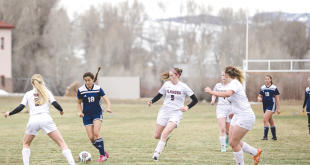 The coaches got their first real look at the team in a game situation when they headed to Gunnison last weekend for a series of scrimmages against four different teams. “It was absolutely encouraging,” says Hamilton. The Titans do have their hands full again this year with their league, arguably one of the top 2A leagues in the state including perennial state powerhouses Del Norte and Sanford. That said, Hamilton feels the team still has a ways to go but they could make some waves. The Titan boys open the season with a tournament in Grand Junction November 30 to December 1 and have their first home game on Friday, December 7 when they host Ouray. “There’s a good feeling in the program, a lot of energy and the guys are confident,” says Hamilton.